Microsoft plans to release two feature updates for its Windows 10 operating system in 2017. That's all the company communicated so far. A feature update will be similar in size and shape to the Anniversary Update for Windows 10 which Microsoft pushed out in August to Windows 10 devices. Rumors suggest that Microsoft might aim for a March 2017 for the next feature update, codename Redstone 2. This would mean that Windows 10 Version 1703 would be that major version. The proof? A new policy in the latest Insider build of Windows 10 requires Windows 10 Version 1703. 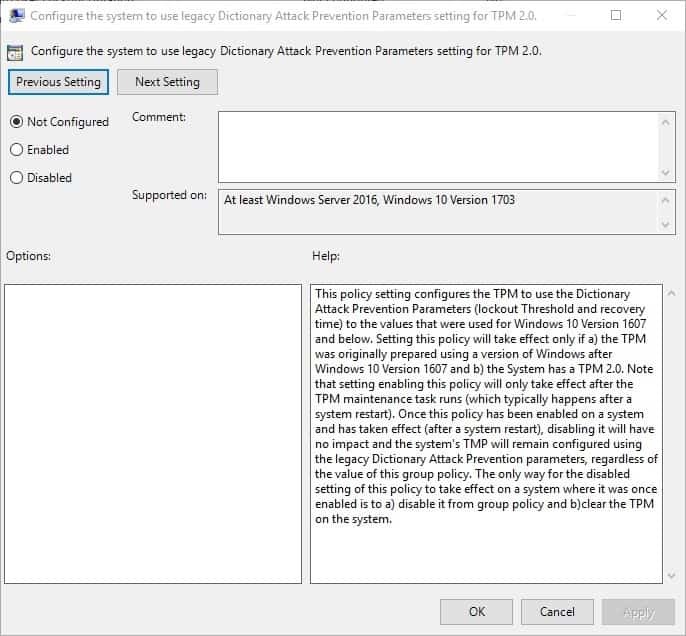 Microsoft lists major Windows 10 versions only in the "supported on" section in the Group Policy editor, at least until now. The version is made up of two digits for the year followed by two digits for the month. 1703 would therefore indicate a release in March 2017. If March 2017 is indeed the release date for Windows 10's next feature update, it would mean another four months of development before the update hits the public. Microsoft's initial plan was to release Redstone 2 after the Anniversary Update in 2016. The idea was to release a smaller feature update in 2016, but Microsoft rescheduled the release to early 2017. What we know about Redstone 2 so far comes from Windows 10 Insider Builds, and to a degree announcements that Microsoft made. Application Guard for Microsoft Edge. Bulk update devices via USB. Contextual Syncing. Sync app data between devices to start exactly where you left on another device. Continuum improvements. Proximity feature, less prone to crashes, independent start menus, and more. New apps, e.g. Microsoft Paint. OneDrive Placeholders are making a comeback. The official reason why support was pulled in first place was user confusion, but it turned out later that it was because of technical difficulties instead. Placeholders mean that all files are displayed that are stored on OneDrive, even files that are not available on the local machine. Office Hub. This feature integrates Office 365 deeper into Windows 10. It provides quick access to documents and other information. OneClip. The feature allows you to copy easily between Windows 10 devices and Office 365. People Bar. Might display contact thumbs of people you have been in contact with recently in the Windows 10 taskbar. Working Sets. Better project management by creating working sets for individual projects. These include files, contact and calendar information in one place. And numerous smaller changes. The Registry Editor gets an address bar for instance, Microsoft is working on a new File Explorer app, and more. Microsoft is working on a number of features that it has not revealed yet to the public. One question that I would like to ask you is what you would like to see in the new update for Windows 10. User Control: User control of the operating system, updates and settings, seems to get less and less with every new version of Windows. I'd like to see more options for users to control the operating system. Give users control to remove features they don't require, manage update behavior, disable the lockscreen, make it easier to select set default apps and get Windows 10 to honor those changes, or customize the start menu according to their needs. Microsoft Edge: I talked about several of the annoyances of Microsoft Edge earlier this year, and fixing those would be a good start. I'd like Microsoft to open up the Store for extensions from all developers to see more extensions being released for Edge. Also, Edge needs a lot of polishing before it becomes a viable alternative. Privacy: I want more transparency when it comes to privacy. What kind of data is Windows 10 collecting, and what is Microsoft doing with the information? Now You: What would you like to see in Windows 10 Version 1703? The post Next Windows 10 Feature Update in March 2017? What would you like to see? appeared first on gHacks Technology News.